In many cases when an audio company manufactures an integrated amplifier, it is usually a compromise on either performance or flexibility of their product. Not so with McIntosh integrated amplifiers! They share the same build quality of their separate components and performance that is second to none! From the CNC machined front-panel glass, to the silent electro-magnetic switching for all sources, to their famous Autoformer technology that assures you get all the power that you paid for, regardless of what loudspeaker is connected! With their new MA-6600, you can have a tuner module directly installed for outstanding sound including HD radio; all in one package! 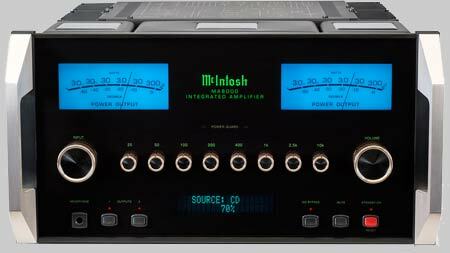 With McIntosh, you can now have it all; performance and flexibility, all in one unit! A monumental and musically engaging performance is what you can always expect from a McIntosh amplifier, and the MA-8000 Integrated Amplifier is no exception, combining a powerful 300 watt per channel amplifier with a full function, and very versatile preamplifier into one space saving unit. This is a no compromise design that will easily outperform many other separate component amp and preamplifier offerings from other manufactures. 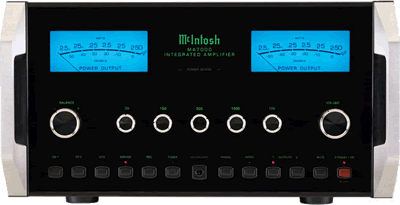 The McIntosh MA-8000 is manufactured unlike any other amplifier; the front panel is fabricated from glass and is backlit from behind with fiber optic lighting to allow for easy operation while also preserving its beauty for years to come. Their famous gorgeous blue VU meters are also present here, to allow instant feedback on the amplifiers output at all times. The amplifier itself is housed in a beautiful polished stainless steel chassis that not only compliments the classic glass front panel, knobs and brushed aluminum handles; it truly is an amplifier that is a pleasure to operate! 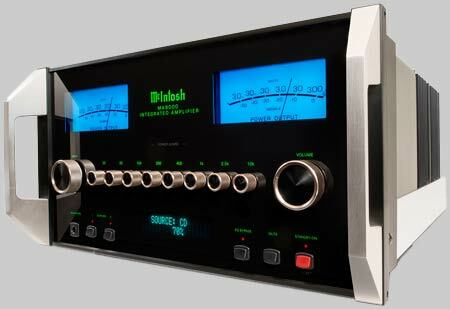 The McIntosh MA8000′s features fifteen total inputs including six unbalanced, two balanced, and two phono inputs to allow connecting even the most elaborate of systems. Both the Moving Magnet and Moving Coil phono sections can be adjusted to completely match your turntable and phono cartridge, allowing your prized record collection to shine. And the discrete, analog eight band tone control is even assignable by input permitting a precise, manual adjustment that lets your favorite music to sound better than ever. The McIntosh MA-8000 also embraces present and future connectivity with five dedicated digital inputs which can decode all of your digital music with an included audiophile grade 32 bit/192 KHz digital to analog decoder for connecting your computer or an Apple Mac Mini to assemble a state of the art music server! The patented McIntosh Autoformer in the MA-8000 guarantees your speakers will always receive the full 300 watts regardless of their impedance, while the exclusive Power Guard circuitry will prevent clipping distortion that could damage your speakers. If you are looking to replace your existing amp and preamplifier, this is an amplifier that must be seen, (and heard! ), to be fully appreciated. It truly offers the performance of separate components, but in an all-in-one chassis solution. Stop in today and bring a favorite CD or two and prepared to be amazed! The new McIntosh MAC-6700 is their first receiver since 1993, it is designed to entertain and bring joy to the next generation of music lovers! With 200 watts per channel, the MAC-6700 uses the same amplifier technology that is found in their separate power amplifiers, such as McIntosh's patented output Autoformer, ensures its full rated power regardless of your loudspeakers impedance. With the McIntosh MAC-6700, you will always get all the power that you paid for! 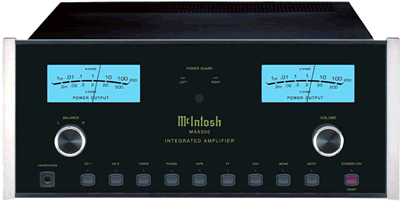 Another key technology that the McIntosh MAC-6700 receiver includes is Power Guard; again, this patented technology prevents the amplifier from clipping, (the harmful distortion that damages your loudspeakers). You'll never have to worry about harming your precious loudspeakers due to high distortion with the MAC-6700. The preamplifier section of the MAC-6700 features a total of 11 inputs, which include two dedicated phono inputs with Moving Magnet and Moving Coil that will breathe new life with your treasured vinyl records. However, one the most exciting features that the MAC-6700 offers is the three digital inputs. There are one optical, one coaxial, and one USB input. All these inputs will decode all your digital sources, such as, music stored on your computer, and are processed thru an ultra-high quality 32 bit 192 kHz DAC. The exceptional tuner section found in the McIntosh MAC-6700 receives your favorite radio stations with a clarity and realism that is free from noise and distortion. The tuner section in the MAC-6700 offers a level of performance that far exceeds that of separate component tuners that are being offered from many other manufactures. Power, versatility, and amazing sound quality of the new McIntosh MAC-6700 Stereo Receiver will deliver a level of performance and quality which will bring smiles and joy to whoever owns one for many years to come! Much more than just a "receiver", the McIntosh MAC-6700 offers the audio performance of separate components, but housed in one chassis. This is the most powerful integrated amplifier that McIntosh has ever manufactured! At 250 watts per channel, it will drive any speaker to it's fullest potential filling your room with the most life like sound which was thought to only be possible with seperate components. Among the many features included is Power Guard to protect your speaker from being damaged and your ears from harsh distortion, the famous McIntosh autoformers so you get all the power you paid for while insuring the amplifer runs cool even when you are playing your music loud. Even a five band equailzer will allow you to tailor your music to your taste with precision. 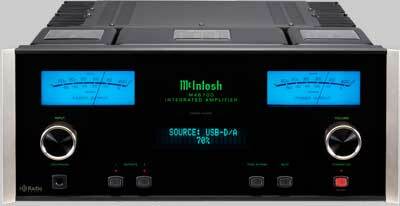 The McIntosh MA-7000 has seven inputs including a phono input! All inputs feature silent electro-magnetic switching that will give you many years of reliable trouble free service! Incredibly build and sound quality to match from a company that has been creating some of best audio components right here in the USA! The latest integrated amplifier with all the latest technologies that McIntosh is famous for! At 100 Watts per channel and seven input sources; including phono; this amplifier will be the center of a high-quality audio system that will give you pleasure many years to come! If you considering purchasing a new McIntosh system, this amplifier is a very comfortable place to start!